If you are a Microsoft Project user, you might be using recurring tasks to add monthly stakeholder events or other regular activities. It’s useful to remember that recurring tasks, don’t actually have to be tasks with durations, resources and costs. 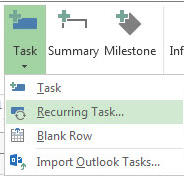 On a task table, click on the row you want to add a recurring milestone to. From the Task tab, click on the arrow below the task button. Add the milestone name and enter the duration as zero. Entering zero, will make it a milestone. Double click on an individual milestone to rename it or make other changes to that occurrence. If you would like to learn how to build schedules and reports in Project or find out about Microsoft Office in general please do get in touch. next post: How to get even more than training from your training!